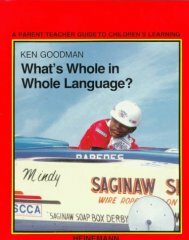 BOOKSHELF: What’s Whole in Whole Language? One more before logging off for the weekend. This is a rare book and it’s a school syllabus – ages ago. This book talks about learning language needs to be seen holistically and engaging – not just a conceptual and dry academic exercise. This is an excellent book if you are homeschooling and wondering how to “teach” language, rather how to allow our children to learn languages. Unfortunately this book is our of print. Try going to BookExcess or one of those used bookshops and see if you get it. We also found a new edition, a 20th anniversary edition available from Amazon.com here , I think there are also old copies. It is worth buying. This entry was posted in BOOKSHELF and tagged Ken Goodman, language. Bookmark the permalink.